Anthony Martial's stunning solo goal and a Paul Pogba brace propelled Manchester United into the top four for the first time since the opening weekend of the season as embattled Fulham's plight worsened. An eye-watering 11 points off the Champions League spots when Jose Mourinho was sacked, caretaker manager Ole Gunnar Solskjaer's stunning start to life at the helm has seen them claw back that gap in style. 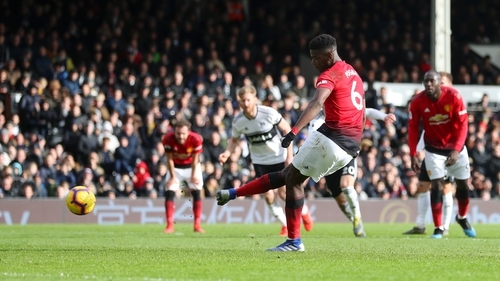 Martial's scintillating run and finish was the pick of the goals on a blustery afternoon at Craven Cottage, where Pogba followed his impressive opener with a second-half penalty that sealed a comfortable 3-0 win that increases the pressure on struggling Fulham. Solskjaer's side could be usurped again by Chelsea on Sunday, but this is a big psychological boost as the Norwegian's impressive audition for the permanent post continued with a 10th win in 11 matches in all competitions. The decision to make six changes with Tuesday's Champions League last-16 first leg against Paris St Germain on his mind could have backfired in the capital, but Fulham and their dreadful defence were no match for the visitors. Pogba capitalised on poor defending to fire past Sergio Rico from an acute angle, before Martial ended a dazzling run of power and pace with a smart finish. Pogba's spot-kick wrapped up United's first sixth straight away win in all competitions - their best run on the road since 2009 - as Fulham floundered again under Claudio Ranieri. Ranieri's side had started brightly enough and Luciano Vietto struck wide inside the opening minute before divisive Andre Schurrle had two attempts. But that confident play was short-lived, with an early error by Fulham centre-back Maxime Le Marchand sapping confidence. So concerned about Martial cutting onto his right foot, Fulham failed to properly track Pogba's run and the midfielder lashed home from an acute angle. It was a superbly-hit effort, although goalkeeper Rico could have done better. United won possession and Phil Jones found the fleet-footed attacker just inside his own half. The Frenchman took off, bursting forward under pressure from Denis Odoi and jinked past Le Marchand before finding the bottom corner. Handball appeals and a deflected Jean Michael Seri attempt was the meek response offered by Fulham, who saw Martial and Jones efforts deflect wide as half-time approached. Calum Chambers was denied by David De Gea before the break, with the second half just eight minutes old when the natives became restless. "You don't know what you're doing" chanted a number inside Craven Cottage as Ranieri brought on Cyrus Christie for Schurrle, with fans singing the name of substitute Ryan Sessegnon. United dominated the second half without exerting themselves. Chambers and Aleksandar Mitrovic had chances during a rare Fulham period in the ascendancy, with Ryan Babel somehow hitting the post from close range after substitutes Alexis Sanchez and Scott McTominay went close at the other end. United, by contrast, remain unbeaten under Solskjaer ahead of matches against PSG, Chelsea and Liverpool.